RECIFE, Brazil (CNN) -- Seventeen bodies have been recovered from last week's crash of an Air France jetliner off the South American coast, Brazil's military said Sunday. 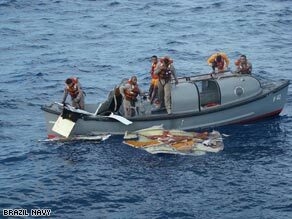 A boat from the Brazilian navy picks up debris in the Atlantic on Sunday. Air France 447 disappeared over the Atlantic early Monday. The jet was en route to Paris, France, from Rio de Janeiro, Brazil, with 228 passengers and crew aboard. The bodies were found floating about 700 miles (1,100 kilometers) from the Brazilian coast. Items found in the same area Saturday were confirmed to have come from the jet, including pieces of the aircraft's wing section, luggage and a leather briefcase containing an airplane ticket with a reservation code for the doomed flight, Brazilian air force spokesman Jorge Amaral told CNN. Fourteen aircraft -- 12 Brazilian and two French -- were participating in the recovery efforts, along with five Brazilian ships and one French frigate. In Washington, a U.S. defense official told CNN the U.S. Navy will contribute two high-tech acoustic devices to listen for emergency beacons still operating in deep water. The "towed pinger locators" help search for emergency beacons on downed aircraft to a maximum depth of 20,000 feet, and will be placed aboard two French tugs that are part of the search efforts, the official said. Recovery of bodies and debris is significant not only for families, but for crash investigators, said Mary Schiavo, a former inspector general for the U.S. Department of Transportation. "Even if they don't find anything else they can get some very important clues from the pieces that they do find and from the human remains," Schiavo told CNN Saturday. She said investigators would be able to discern if there was an explosion from possible residue on the bodies or other items. Or, if water is found in the lungs of victims, investigators would know the plane went down intact, she said. Investigators in Paris said Saturday that the Air France flight sent out 24 automated error messages lasting about four minutes before it crashed. The error messages suggest the plane may have been flying too fast or too slow through severe thunderstorms it encountered before the crash, officials said. Schiavo said the four minutes of automated signals sent from the plane "was a very long time." Investigators also reported the airline failed to replace a part on the aircraft, as recommended by the manufacturer, Airbus. Airbus had advised airlines to update equipment that monitors speed, known as Pitot tubes. The recommendation was a result of technological developments and improvements, an Airbus spokesman told CNN. The change was not mandatory, and the spokesman would not comment on Air France's failure to follow the advice. CNN's Karl Penhaul, Richard Quest and Barbara Starr contributed to this report.